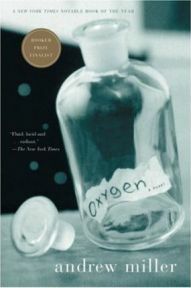 Oxygen by Andrew Miller is set in the summer of 1997, and tells the linked stories of four characters. Three are the members of a single family. Alice Valentine, an ex-teacher, is slowly dying of cancer in her home in the West Country. She reflects a little on her past and tries to cope with the expectations of her family while struggling with the relentless downward course of her illness. Her younger son, Alec, returns from London to the family home to stay with her. He has always lacked confidence in life and relationships, but has now found a niche as a translator of foreign literature into English. Alec has lived very much in the shadow of his elder bother Larry, clearly Alice’s favourite. Larry is in many ways the opposite of Alec – socially adept, a world-ranked tennis professional who has travelled the world before marrying, settling in Los Angeles and becoming a soap opera star playing the role of a hospital doctor. However, Larry’s life is slowly unravelling – he drinks too much, is currently unemployed and in financial trouble, has an unhappy marriage and a disturbed young daughter. He has managed to hide most of this from his family and the public, but as he returns to England to his mother’s bedside it is clear that something will have to give. Meanwhile, in Paris, Hungarian playwright Lazlo Lazar continues with his literary life. He is a well-established, successful figure, with a happy long term relationship and a close circle of friends. Perhaps only his works – a succession of nihilistic, gloomy, existentialist plays – give a clue that he, too, is struggling with the past. Lazar is linked only at a distance to the Valentine family back in the West Country – Alec is translating one of his plays into English. However, during the course of Oxygen, he (like the other characters) finally confronts the issue that has been troubling him, and has an opportunity to break free from his past. Oxygen was shortlisted for the Booker Prize in 2002, the year in which Peter Carey won with The True History of the Kelly Gang (a book devoid of commas). It is a well written and engrossing piece of literary fiction, and was certainly worthy of this accolade. Andrew Miller creates four quite different characters, and writes from the perspective of each in a convincing way. Reading the book, I could understand the dilemmas of each and why they had arrived at their current place. Each was paralysed in a different way – circling around a problem in their life and unable to take definitive action to resolve it. Each was given or created an opportunity to finally break free. It might be too much to say that Oxygen was an enjoyable read, but it was always an interesting one. All of this sounds a little gloomy, and indeed the tone of much of the novel is a negative one. However, at the end most of the characters have a glimpse of a more positive future, and there is a sense that it is there for them to take if they wish to do so. However, be warned – Oxygen does not provide any neat endings or plot resolution. If you prefer to finish a novel with a sense of a story which is complete and certainty about the fate of the participants, then Oxygen is definitely not for you.